Accompanied by my family members, I was crisscrossing Morocco for a cultural extravaganza. We were on our way from historic Fez to the blue city of Chefchaoun on road, when our youthful local guide Hassan from Adrar Travel would suggest that we might be interested to check out some ancient Roman ruins at Volubilis, a UNESCO World Heritage Site, not far from the direction we were heading to. 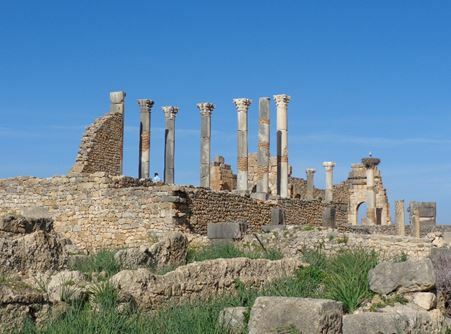 The thought that the Romans had even expanded their empire to Morocco, situated at the northern tip of Africa was stimulus enough to make the quick decision of a detour to head towards the site. On the way we learned some history lessons about the place from Hassan. A small hamlet was originally built by the indigenous Berbers around 3rd century BCE in that fertile valley, surrounded by the mountains. 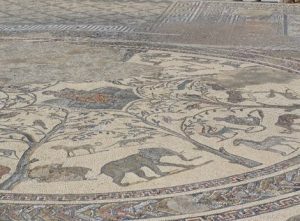 Romans ventured into the area around 1st century CE, especially for its temperate climate, suitable for olive-growing, a major part of the agro-economy of the time period. The place prospered under the Romans along with their building of period-specific architectures. However, the place was retaken by the locals near the end of the 3rd century CE. Due to its remoteness from the original seat of power, Romans never attempted to repossess the area. Though subsequent civilizations flourished here, the emergence of Fez as an important business center brought its decline leading to a forgotten place until the ruins were discovered. On entrance into the complex, a gorgeous panoramic scenery of the ruins nestled inside the valley came to our view. 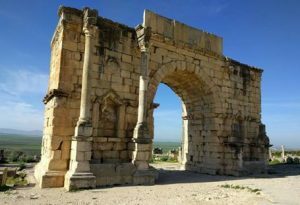 Accompanied by a local guide, we headed towards the Triumphal Arch (also known as the Arch of Caracalla) that was purportedly situated at the end of the main street of the city. The current structure is a reconstructed one from the assembled ruins. Ancient Roman dedication inscription on the top of the arch was clearly visible. Historically, the arch was topped also by a bronze chariot pulled by six horses, while nymph-statues poured water into carved marble basins at the foot. 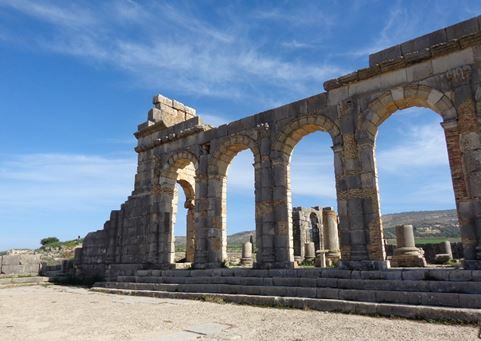 From there, we headed towards the ruins of some historic living quarters as well as the halls for festivities for which Romans were famous for along with their bulimia. Fortunately, several of the artistic mosaic floor from the Roman era still do exist, inside some of these structures. Though only a portion of the ruins have been excavated so far, it already offered a glimpse of time-specific architecture. One of them is the Basilica that was used for administration of justice and governance of the city. The large openings on a section of the outer wall gave us a sense of the enormity of the original building. The other important excavated structure here is the Capitoline Temple, distinctive for its Corinthian columns. The temple was dedicated to the three chief divinities of the Roman state, Jupiter, Juno and Minerva. In addition, the courtyard here was also utilized as a civic assembly for important public events. We spent some more time inside the ruin-complex looking into some of the ancient objects found during the excavation, while soaking into the history of the place. Then it was time to head towards the blue city of Chefchaoun.